There are two main reasons why it is necessary to monitor content marketing. First of all, you will get the opportunity assess the influence you were able to make with the published content. This influence is reflected in numerous ways, including the number of sales, visits, leads, etc. Secondly, you will get to see how content marketing affects your business, how it implements with other types of online marketing, and whether this is something you should invest more into in the future. Evaluating content is somewhat complex due to the numerous factors that contribute to its performance and due to the fact that performance can be measured only when you take all the metrics into account. This is why, with content marketing, metrics should be analyzed cumulatively. The first metric you will need to monitor is the number of visits to the specific content you want to analyze. The best way to monitor visits is to have content hosted on your own website or blog. This way you will have access to the analytics data. One of the most commonly used tools for this purpose is Google Analytics. It is free and easy to set up, with a straightforward interface for monitoring and managing the data. Alternatively, you can use other tools for monitoring the statistics on your website. Even if you host content on websites such as YouTube or Medium, these platforms provide statistics for the published content. The main obstacle occurs when you write a guest blog post, in which case the content is published on another blog or website, and it is most likely that you will not have access to these statistics. Occasionally, the website owner might provide you with the relevant data. What can the number of visits say about the content? The main information you get indicates the number of people who have seen the content. That is the number of people who took the time to click on the link. If the number is high, this means that the title and the accompanying text were engaging enough. If you notice a lot of organic traffic, this means that this piece of content is well-optimized in terms of SEO and that it is shown high in the search engine result pages. If there are lots of referrals, this could mean that an influential blog or website has shared your content, regardless if this is something you have planned to do or if they have done it on their own. Negative statistics indicate that certain aspects should be changed. To analyze why the number of visits was low, you have to take into account all of the factors that make a good post, all optimization elements, etc. Sometimes you might even do everything right and the visits still will not go up. Maybe your timing was off, or perhaps you mistakenly believed that a certain topic is popular, when in fact, it is not. The important thing with poor results is to try to detect the problem with lots of testing and comparison with other content you publish. If you believe that content is valuable, even though it got little attention, you could also try to repurpose content later on. There has been a lot of success stories when the content was republished in another form, for example, a dull blog post became an exciting infographic. When monitoring visits, try to detect the place the clicks are originating from. The link might get shared on social media, in an email, on another website or anywhere you might have posted the link. The link can also be shown in the organic search results or in paid ads. 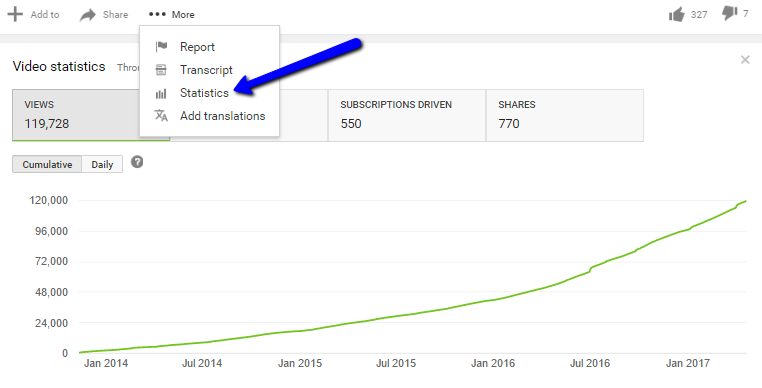 Analyzing the visits based on the source can help you determine which of the strategies shows the best results, which might offer valuable insights into how you should be changing and/or improving your content marketing strategy. The number indicates the number of visitors who have visited your website for the first time. This metric, in comparison with Returning visits, shows how likely you are to attract new visitors. The metric shows the total number of pages the users have clicked on during a specific time period. Ideally, this number should be higher than the number of unique visits. If this is the case, it will mean that your content is engaging because the users are clicking on more than one page per visit. The time the users spend on your website is expressed through average session duration. 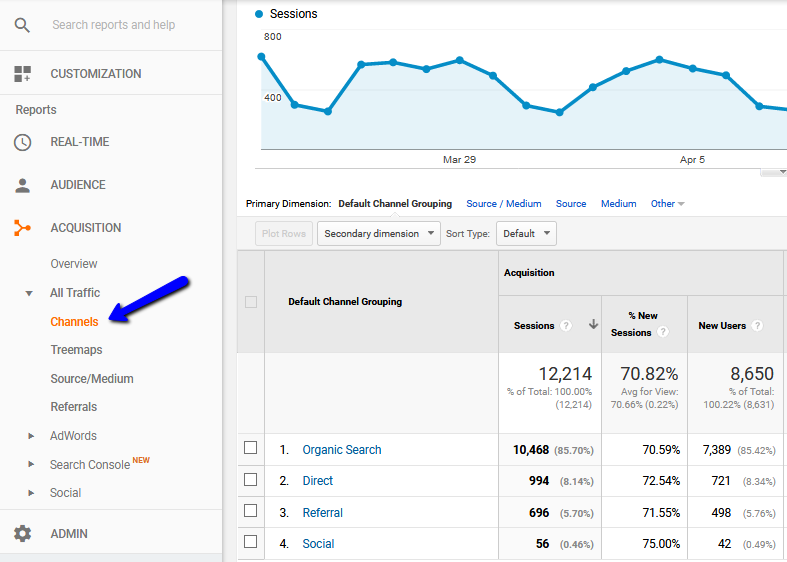 Besides the overall average session duration, Google Analytics also enables you to see the visits based on the session duration interval. This will show you the number of visits lasting up to 10 seconds, the visits lasting between 11 and 30 seconds, and so on. The longer you keep the visitors on your website, the better are the chances to convert those visitors. A certain number of users click to visit your website and then leave immediately, without clicking on any other page. This is called a bounce rate, and the metric indicates poor engagement level, which is why you should aim for the lower bounce rate. 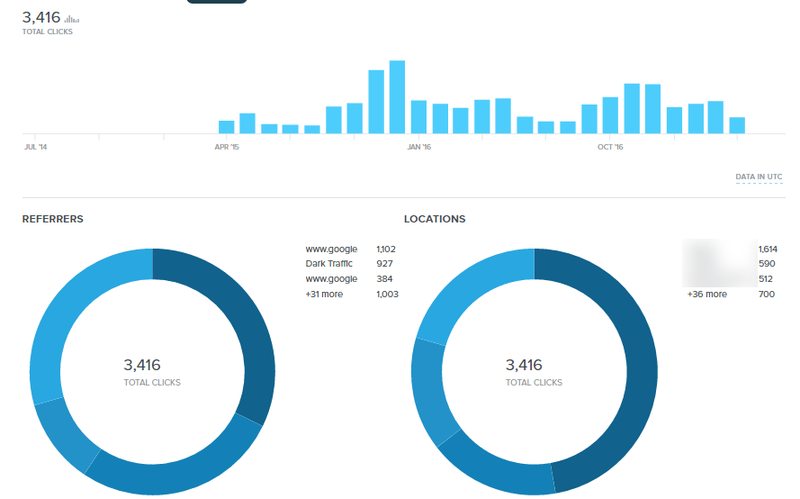 The data about traffic sources show you how you generate new visits. It can be through organic search, direct traffic, referral or social. It is important to know about these sources as it can help you optimize and improve your business in order to boost traffic. Knowing about the visits is one indicator of how popular and successful the content is, but in content marketing popularity of the content on its own is not the only goal. With your strategy, you want to achieve something, regardless if those are sales, new leads, social followers, etc. To learn how these visits actually affected those global goals, you will need to look into conversions. A conversion is a desired action, something you want online users to do from which you will benefit, such as liking your page, downloading your ebook, watching your video, or ultimately buying your product. Having in mind that each business is different with different goals, it is natural that conversions cannot be defined in general, rather than on an individual level. This means your business determines what conversion is for you. Ask yourself the question “What do you want users to do when they get to your website?”. Your answer is the action you will consider conversion. Through the content marketing strategy, you try to reach conversions. For example, you publish a blog post about email marketing. You attract many visitors who are interested in this topic. At the same time, you sell an email marketing software, and naturally, you want them to buy the software. In essence, the content is a sort of a bait. You attract the relevant visitors with the high-quality content, and then you try to convert those visitors into customers. To achieve conversions, you will first have to publish high-quality, engaging content which attracts the users you will potentially convert. The audience you attract should be relevant to your business, so make sure you use platforms and paid advertising targeting options that bring visitors that are interested in your business and could eventually buy from you. This link enables everyone to go to your homepage and find out more about your business. Homepage link is essential to provide more information about your business, especially for the first-time visitors. When possible, provide internal links alongside the new content you publish. For example, you could provide a previous article as a reference or you could add related content suggestions. This will reduce bounce rate and it will help you keep visitors longer. This link is the best way to increase conversions because it directly leads to the page where you can convert the visitors. The landing page will contain a brief description and a CTA that will encourage conversions. Sometimes the actual content can contain the CTA. In order to measure conversions, you will need to analyze the conversion rate. The higher the conversion rate the better because this indicates that you are creating truly valuable content that resonates well with your audience and is able to convert them. If you notice a low conversion rate, it is time to optimize your content strategy and think about a different approach to try to increase conversions. How to monitor the metrics? To evaluate the importance of content marketing for your business, you will first need the tools for tracking content published on your own blog, as well as on third-party blogs, social media, social bookmarking websites, etc. One of the most commonly used tools for monitoring the website analytics data is Google Analytics. This is the page opened by default in the Google Analytics account. It shows the statistics for the chosen period, including the most relevant metrics to assess visits, such as the number of sessions, page views, average session duration, bounce rate, etc. The audience data also includes demographics and geo details, behavior of the visitors, the technology used to access the website, etc. All of this can help you a lot with evaluating how your website content performs. 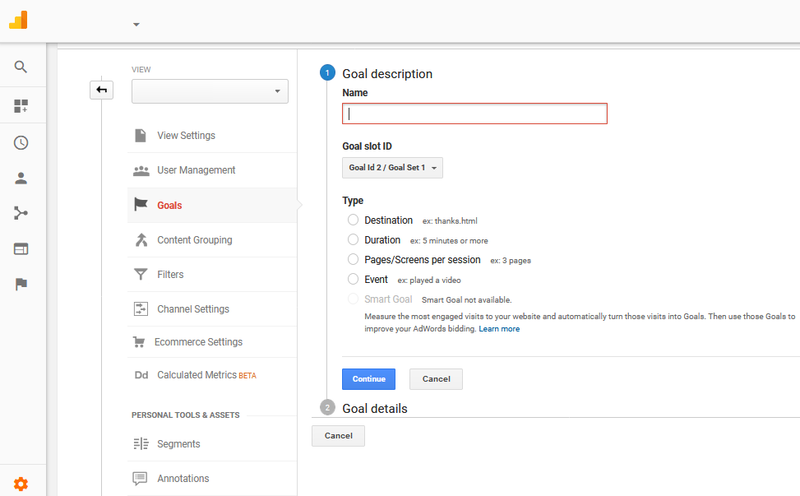 Goals are used for tracking desired activity through Google Analytics. By setting up a goal, you choose an action, such as the number of pages visited per one visit, visiting a specific page, a certain session duration, etc. This action will be a goal you want to achieve. 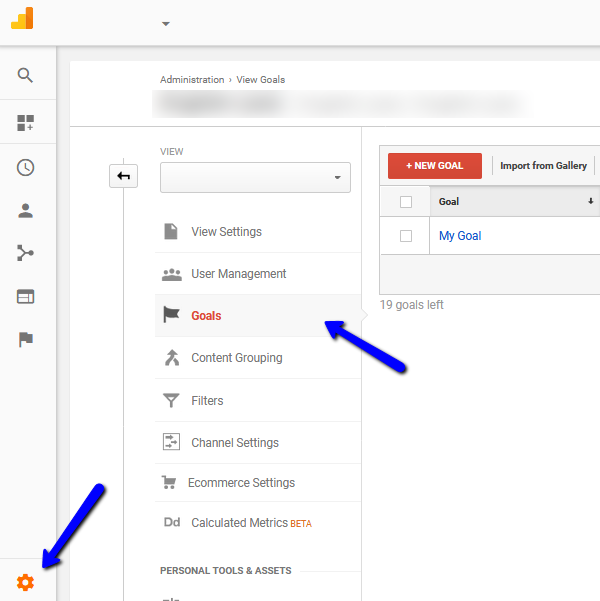 To set up a goal, go to the Admin section of Google Analytics (lower left corner) and click on the View you want to manage. Then find the option Goals in the menu shown beneath this view. Click on the button +New Goal and fill in the details about the goal you want to track. Once the goal is activated, Google Analytics will track all the traffic that resulted in goal completion. You will get additional data about the goal completion rate, sources, etc. This will enable you to determine which traffic helps with goal completion. It is also possible to assign a monetary value to each goal, in which case Google Analytics will also track and calculate goal value. Advanced segments are used to configure certain filters that create a customized view. Google Analytics still tracks all the data, all the traffic coming in, but for a segment, the data is limited by the filters you choose. This means that you might get to see only a part of the website traffic, which is relevant to the segment. When it comes to content marketing and evaluating the performance of this strategy, advanced segments allow you to filter traffic by specific actions that help you understand the performance of the content you share online. You will have to click on +New Segment to create a new one that will filter the data based on your criteria. For example, use Traffic Sources/Keyword to filter traffic by a keyword used to reach your website, with both paid and unpaid traffic. On the other hand, if you want to focus on exploring the behavior and habits of mobile users, use Technology/Mobile option to filter the traffic coming from mobile. This way, you can click on the advanced segment and get the data about mobile users exclusively, which gives you insights into how they behave, what type of content is the most popular among them, what the conversion rate is, etc. Campaign URL builder is a very helpful tool for tracking content performance. It basically allows you to tag each URL based on different criteria, such as campaign source (search engines, newsletter, etc. ), medium (banner, email, social media, etc. ), campaign term, content, etc. 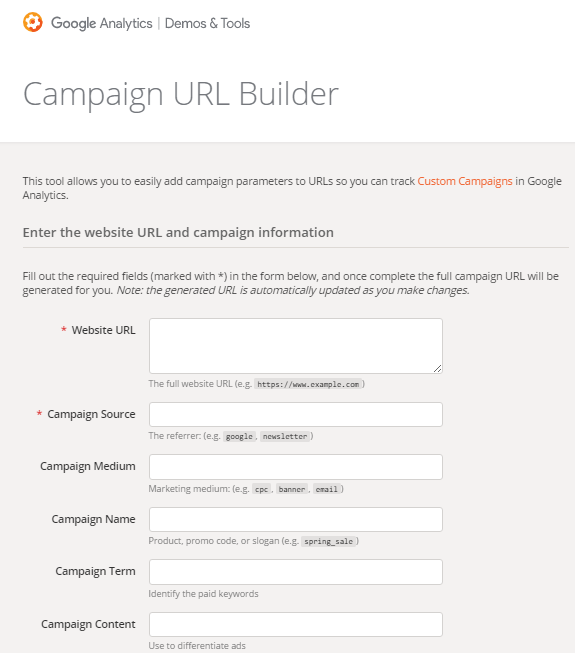 Campaign URL builder can then be linked to the Google Analytics account to show detailed information about each URL. Another way to track the performance of the content is by using shortening services, such as Bitly. These services basically allow you to track the content URL. You will create a custom URL through the service and then track its performance through the statistics that are available. You will get the data about the clicks, about geographic distribution, etc.